You want drawings that look like those you’ve always done by hand — or better. Exquisitely detailed. Perfect arrows. Crisp lines. Or maybe even a squiggly sketch. You don’t want it to look like it was done on a computer. PowerCADD lets you draw like that. And it doesn’t get in your way. Draw floor plans. Machinery. Charts. Sketch a bush. Doodle a cloud. A flower. Do it your way in PowerCADD. It’s easy, and it’s fun. There is no limit to your imagination, and no limit to what you can create with PowerCADD. Our users design and create houses. Malls. Apartments. Flutes and piccolos. Toys. Pipe organs. Furniture. Fonts. Machinery. Refrigeration units. Carcass grinders. Theater lighting. Trade show exhibits. Technical documentation. Books. Brochures. Maps, Subdivisions. Just to name a few. They are all creative, and they all want to do it their way. Not the computer way. PowerCADD has open, expandable architecture with Externals — additional tools and commands which can be added by merely placing them into a special folder. So PowerCADD is more powerful and customizable. The best part is that a full set of Externals for architecture, engineering, and graphic design comes with every copy of PowerCADD, as well as the ability to read and write DWG/DXF files. Within your first hour, you will realize this program is different. You have that old feeling of drawing on paper. You can move around quickly and easily. Draw lines and shapes. Drop in doors and windows. Dimension the whole drawing in less time than it takes to get a cup of coffee. The curves. The colors. The shading. Turn your genius loose. Parallel lines. B-Spline smoothing. Bézier curves. Fillets and chamfers. A variety of shear functions and area/perimeter calculations to get you through the toughest, most complicated projects. You have all of the tools for the work you have to do. And time for the creative things you want to do — that make your drawing your own masterpiece. And to add icing to the cake, PowerCADD is also a production drafting classic, with the ability to get the work out on time, every time. And since learning the basics of PowerCADD takes less than a day, you and your staff are actually making money in much less time than with those other CADs. When our users are asked what features they like best about PowerCADD, the answers ranged from it’s easy, to the ability to customize just about everything, to it just works like it ought to. 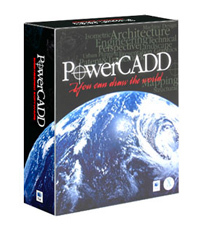 PowerCADD offers extensive layering ability, limited only by the memory capacity of your Macintosh. You can see all layers of the drawing at the same time. Both above and below the active layer. Or hide layers with ease. Assign a color, scale, or even transparency to a layer and tell at a glance the condition of your drawing. You can hide some layers and gray others to make complicated part of your projects go more smoothly. Then toggle back and forth between different pre-set layer combinations with command keys as your needs dictate.